Is there such a thing as information justice? In this paper, I argue that the current state of the information economy, particularly as it regards information and computing technology (ICT), is unjust, conferring power disproportionately on the information-wealthy at great expense to the information-poor. As ICT becomes the primary method for accessing and manipulating information, it ought to be treated as a foundational layer of the information economy. 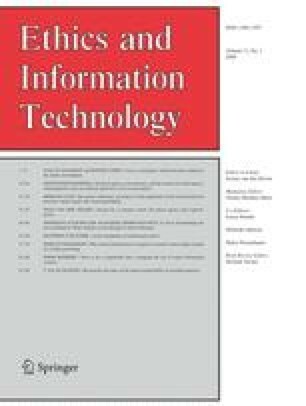 I argue that by maximizing the liberties (freedom to use, freedom to distribute, freedom to modify, and so on) associated with certain computer software, an incentives-rich and stable environment can be established in ICT that will foster development of the information economy among the information poor. I suggest that the now-mature Free and Open Source Software paradigm, which has already produced widely-used enterprise-class applications, can be harnessed in support of these ends. Creative Commons. Creative Commons. http://creativecommons.org/. Accessed 31 Jan 2007. Faden, E. (2007). A fair(y) use tail. http://cyberlaw.stanford.edu/documentary-film-program/film/a-fair-y-use-tale. Accessed 17 Nov 2007. GNU Free Documentation License. (2002). Nov. GNU.org. http://www.gnu.org/licenses/fdl.html. Accessed 31 Jan 2007. Gosh, R. A. (2003). License fees and GDP per capita: The case for open source in developing countries. Fist Monday, 8(12), December. http://firstmonday.org/issues/issue8_12/ghosh/index.html. Accessed 12 Nov 2006. Hirsch, T. (2003, Aug 1). Seed battle heads to Supreme Court. BBC News. http://news.bbc.co.uk/1/hi/sci/tech/3116713.stm. Accessed 1 Feb 2007. Khiem, P. G. (2004, March 2). Decision no. 235/QD-TTg of March 2, 2004 approving the overall project on application and development of open-source software in Vietnam in the 2004–2008 period. Ministry of Posts and Telematics, Socialist Republic of Vietnam. Hanoi, Socialist Republic of Vietnam. http://www.mpt.gov.vn/details_law_e.asp?LawDoc_ID=100138. Accessed 28 Jan 2007. LaMonica, M. (2005, Sept. 23). Massachusetts moves ahead sans Microsoft. C|Net News.Com. http://news.com.com/2100-1012_3-5878869.html. Accessed 31 Jan 2007. Leonard, A. (2006, Jan 12). Free Software, Big Oil, and Venezuelan Politics. Salon.Com, How the World Works column. http://www.salon.com/tech/htww/2006/01/12/venezuela/index.html. Accessed 30 Jan 2007. Lessig, L. (2006). Code, V.2. Ch1, Part 2. http://codebook.jot.com/Book/Chapter1/Ch1Part2. Accessed 4 Dec 2006. Miller, F. (2002). Aristotle’s political theory. Stanford encyclopedia of philosophy. http://plato.stanford.edu/entries/aristotle-politics/. Accessed 29 Jan 2007. Netcraft. (2007, January). January 2007 Web Server Survey. Netcraft.Com. http://news.netcraft.com/archives/web_server_survey.html. Accessed 31 Jan. 2007. One Laptop per Child. One Laptop Per Child. http://laptop.org. Accessed 31 Jan 2007. Perens, B., et al. The Open Source Definition: Version 1.9. The Open Source Initiative. http://www.opensource.org/docs/definition.php. Accessed 9 Nov 2006. Red Flag Software. http://www.redflag-linux.com/eindex.html. Accessed 31 Jan 2007. Sojo, C. A. (2004, Dec. 8). PDVSA moves to Open Source too: Venezuela embraces Linux and Open Source Software, but faces challenges. Venezuela Analysis. http://www.venezuelanalysis.com/news.php?newsno=1439. Accessed 28 Jan 2007. Staff writer (2003, Nov. 3). Vietnam government opts for open source. CNET Asia. http://www.silicon.com/management/government/0,39024677,39116719,00.htm. Accessed 26 Jan 2007. Stallman, R., et al. The Free Software definition. Free Software Foundation. http://www.gnu.org/philosophy/free-sw.html. Accessed 23 Oct 2006. “Welcome to Rosetta.” Launchpad Project, Ubuntu. https://translations.launchpad.net/. Accessed 31 Jan 2007. Wilpert, G. (2003, Aug. 30). The economics, culture, and politics of oil in Venezuela. Venezuela Analysis. http://www.venezuelanalysis.com/articles.php?artno=1000. 29 Jan 2007. WIPO. (1979). Berne convention for the protection of artistic and literary works. World Intellectual Property Organization. http://www.wipo.int/treaties/en/ip/berne/. Accessed 4 Dec 2006.